I had to crawl around under my house recently to figure out where to run some wires, but it was dang uncomfortable. My foundation isn't a slab, at least not on the top. So after throwing away my bloody shirt and healing, I put some cardboard down and crawled around some more, and it was better. ...but it was still uncomfortable. The floor was something like 18" from the 'ceiling' on my crawlspace. I had to be really careful or I'd hit my head, but it wasn't so bad because of the nice soft padding on the ceiling. After crawling around in this claustrophobic space for a while, I crawled out. Something began to slowly occur to me. It was like an itch, but I couldn't put my finger right on it. After another minute, I realized it was an actual physical itch. ...which spread. Within 5 minutes of leaving the hole, my entire body was itching, especially my exposed skin. As it turns out, the fluffy ceiling in the crawlspace was in fact fiberglass insulation. When I was a kid, my parents repeatedly told me to stay away from insulation because of the itchiness. I assumed this was just a trick to keep me from finding presents in the attic, so I ignored the advice but some how never worked up the energy to go treasure hunting. While I still think it's possible they stored presents up there, the itchiness of my old teddy bear I got for Christmas as a child makes a good deal more sense now. After a few weeks, I thought back to completing my under house survey. I really wanted a way to look for under house leaks and stuff and, in the manner of a responsible home owner, get early warning so I could increase the effectiveness of... Ok, that's a lie. In reality, I wanted an excuse to put a camera on my R/C tank and drive it around scary tunnels, and this just happened to fit my purposes perfectly. I started out with an R/C tank I bought last year. It's got a lot of articulation. The turret rotates, and the barrel goes up and down, so I figured that plus the treads would make it a good platform. The wireless camera I had around the house was one I had bought for another project last year off the eBay. It seems just about perfect for the job as it is super small, self contained, and seems to have good range. One thing I noticed during testing was that the camera had poor low-light performance despite the 6 infrared LEDs on the face, so I included a mini Mag-Lite in my plans. I pondered the best way to mount my booty, then decided to focus on putting the camera on the tank first. First, I tried a clever combination of scotch tape and... more tape. 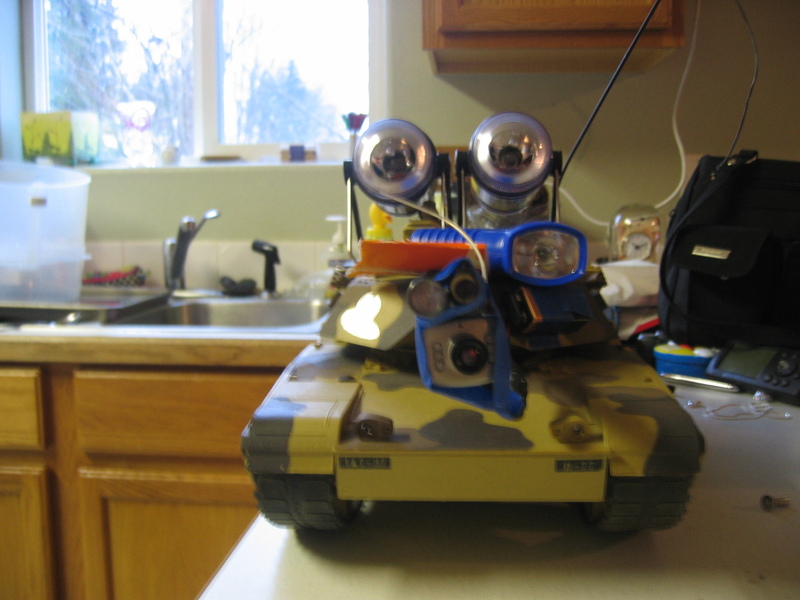 The end result was a pretty skewed camera, "mounted" to the turret in the loosest sense of the word. When I drove the tank, the 'tape snowball' flopped around in all directions like a wet metaphor. I realized that the only way this would work would be with a good supply of Dramamine, so I thoughtfully stepped back and reconsidered. By 'thoughtfully' I of course mean 'fitfully', and by 'stepped back and reconsidered' I mean 'ripped the camera off the tank and immediately gave up on the whole idea'. A few hours later, my wife asked me if I needed anything from the store. Eager at the idea of not having to actually do the shopping myself, I answered in the affirmative. She ended up getting me some painters tape, easier to work with then scotch tape, a little more resilient (which is strange, because painters tape is designed to be easier to remove so it doesn't pull up stuff), and a lot more blue. Using this, I attached the mini Mag-Lite to the barrel and taped the camera next to it. Theoretically, this should give me a platform from which I can pan the camera left & right as well as tilt it up and down. In reality, the anemic motors powering the gun barrel allow me to tilt it to two orientations: down and slightly less down. It's still better then, say, dragging the camera behind the tank by a piece of dirty string, so I left it as is. The mini Mag-Lite is sticking out from the barrel, the camera is the lump beneath the barrel, and the battery that powers the camera is taped to the base of the barrel. The shiny wire coming out of the camera is the antenna for video. The train track beneath the tank is for trains. With my wife waylaid by her wisdom tooth removal (all four at once, yikes!) and the kids being watched by a babysitter, I had free reign to work on my project. I put everything together, then tested it in the living room. It worked pretty good, I drove around while watching the scene on TV and I was able to navigate pretty well. It was daytime and I could see the various obstacles in my living room pretty well. I drove under the dining room table, navigating between the legs of the chairs. Excited, I couldn't wait to try it under the house. Iraqi WMD? Abandoned vehicle hulk in the desert? 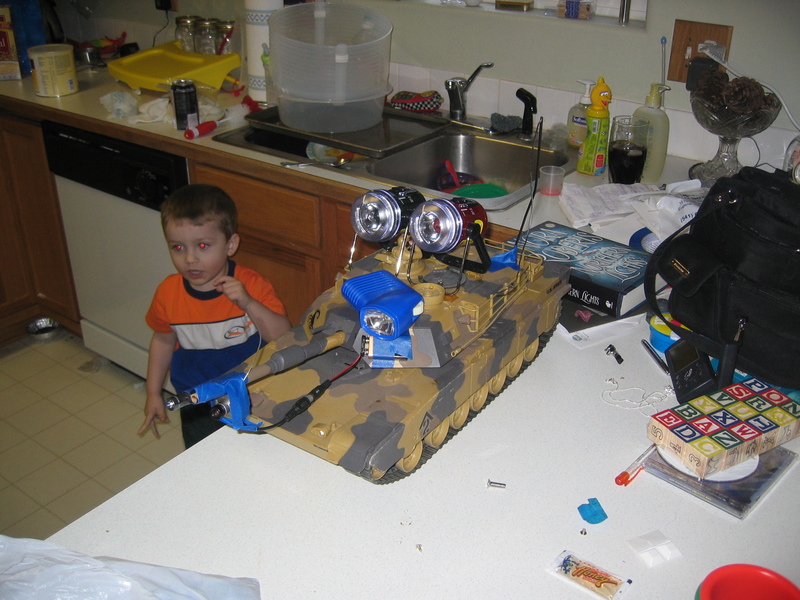 Nope, just one of my sons toys as seen from the TankCam. The spotlight from the mini Mag-Lite clearly illuminates the vehicle. 6. ...and leads to unexpected complete failure! Excitedly, I carried my TankCam to the utility room in my house. I cleared a bunch of stuff away from the hatchway into the crawlspace and opened it up. After doing a quick preflight on all the components, I dropped my new recon-abrams into the hole. The device in place, I retreated to the living room with controller in hand, eager to navigate the depths of my mysterious crawlspace! What strange new things would I find under my house? Pirate treasure? Bodies? PIRATE TREASURE? Technically, that's not correct. I could see a blurry, indistinct blob in the middle of the screen. Curious, I drove the tank forward a little and saw the light move. 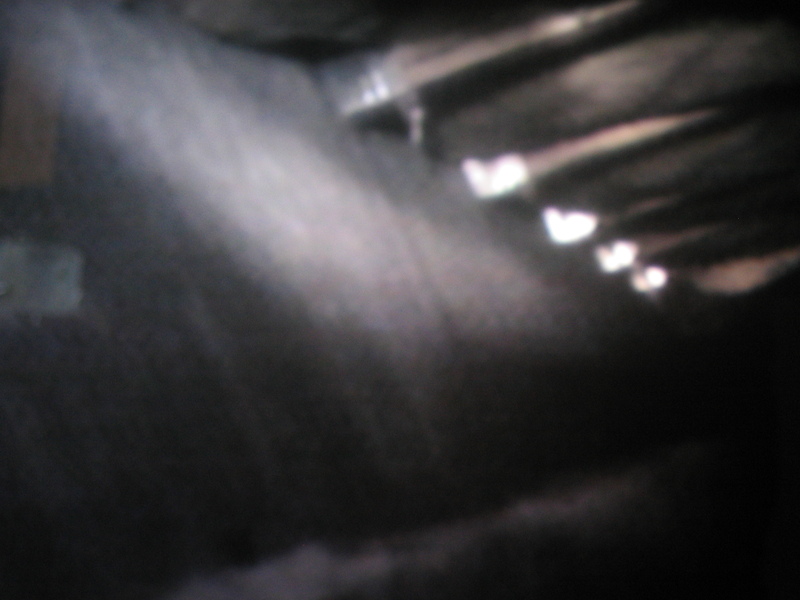 I panned the camera back and forth, and it moved appropriately, but became no clearer. I went back to the utility room and turned the tank around, then checked on the TV. Not great, but I could sorta see the texture of the cement wall. I drove the tank back and forth, and shortly realized I had somehow become totally lost beneath the house. I walked to the utility room, thinking about how I was going to have to crawl under and hope I could find my tank. Unexpectedly, I found my tank sitting immediately below the opening. In fact, it didn't appear to have moved perceptibly, leading me to realize just how ineffective the illumination was. Yaarrgh! As I mentioned in our last action packed segment, lighting was turning out to be somewhat of an issue. I pondered this before brightly deciding to add more lights. 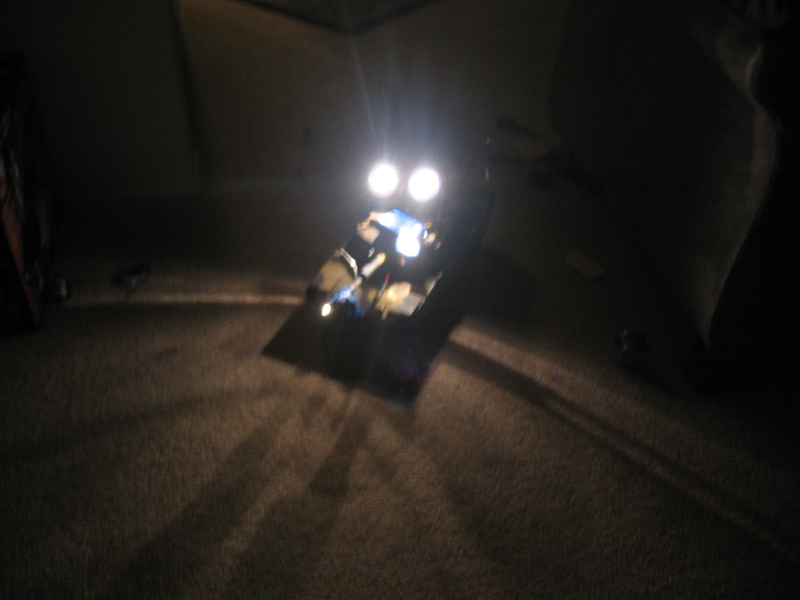 A quick trip to the store, and I soon had a little lamp with variable focus that took 4 AA batteries. It could, depending on how far the power rod was moved, either be a focused spot or a wide, diffuse light. If a little extra light is good, then a LOT is better, right? We dropped down to the store again and got another 4 AA lamp identical to the other, plus a small but bright plastic flashlight. We glued the second lantern atop the turret immediately next to the first, then glued the flashlight behind the main gun. The new Recon-Tank looks like something out of Mad Max. We switched on the lights and were immediately blinded. It was perfect. We dropped our new tracked miniature sun down the hole and retired to the living room. This time, we were able to successfully drive down the corridor and photograph various mysterious places below my house. Visibility was NOT perfect, not by any stretch, but at least this time, we could occasionally see something recognizable. We ran into an immediate problem with the tank. I had noticed before that it was hard to finesse the controls as each track has three settings: Stop, full speed ahead, or recklessly fast backwards. There's no throttle, no way to make small maneuvers. Whenever you go anywhere, you need to be committed to going there FAST or in spastic twitches that make anyone watching the video feed nauseous. We tore down the hallway. After about 15-20 feet, the hallway opened up and the tank drove out into a big open area. Now, I'm using words like 'hallway', but in fact, it's a corridor with maybe a foot of clearance between the ground and the insulation, and it's maybe 3 feet wide. We drove the tank around in this area and photographed some interesting features like a drainage pipe, some support members, and more. Visibility wasn't really great, but it was usable. The real problem was control. Every time you hit forward, the view bounces up and down as the tank accelerates. When it was time to come back, my friend john brought the tank about and navigated back to the opening of what we hoped was the corridor that led to the crawl space hatch. He lined himself up, the jammed both throttles full ahead and began what I like to think of as 'Mr. Toad's Wild Ride'. The camera view was bouncing all over the place, and he was frantically shifting left and ride as needed to avoid obstacles and keep up momentum. After a few seconds of this, I began to hear the sound of the motors getting louder at the hatch and I could see a flicker of light down the hole, so I knew he was on the right track (get it? track? never mind). Suddenly, the bouncing stopped! The tank had gotten stuck! He moved the controls back and forth, trying to get traction, but it wouldn't budge. At this point, we didn't know if he had thrown a track, angered the ghosts of the graveyard our house was built on, or what. After a minute of trying, I realized I would have to go down myself and unstick it. 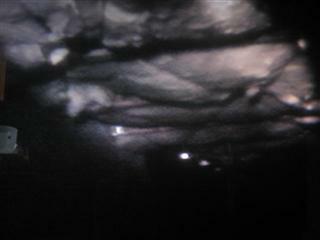 I climbed down the hole and looked down to see that it was about 10 feet away, apparently jammed up on a rock. I dropped to my stomach and began to crawl towards it, pushing as much cardboard ahead of me first to minimize my time in the pain zone. I crawled ahead and made it to the tank, then pulled it free of the rock. Once free, I gestured to the camera for it to come to me. My friend, comfortably sitting in the living room while I was stuck beneath the house, helpfully gave it full throttle. I looked up just in time to see the tank lunge at my face, thankfully he managed to stop before it careened into me. My face is how I make my money, so, that was good. I backed up carefully, and the tank followed me. Those spot lights are really bright when they're all aimed at you. Finally, I crawled up out of the hole and pulled the tank out with me. I was already starting to feel the itching, so I went and changed. 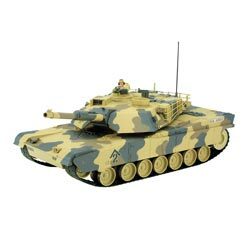 1 x Abrams tank from http://hobbypeople.net/, but they don't stock it anymore. Same model as this, I think. 1 x Wireless camera off the eBay. I bought it from a seller in Hong Kong named 'inesun', but he's not selling any products currently. Same camera as in	this auction. 3/3/05 - Total bandwidth consumed by the slashdotting was around 60 gigabytes. Looks like I lucked out that it was posted on a Friday night! 2/11/05 - Just got posted to	http://slashdot.org/ - Holy crap. I'm paying like $7 a month for hosting via	http://www.hostsave.com/ and I'm hoping this plug will help me avoid getting a huge bandwidth bill. If you start up with them, feel free to tell 'em where you heard about them! Please, I have children to raise! We have a pizza restaurant in Springfield, OR. 15% off any orders at	Figaro's Pizza if you say you saw it on slashdot.